We are excited to announce that the Low Impact Development Toolkit won a Crescordia Award in the Healthy Communities (Public Policy/Plans) category from Arizona Forward, Arizona’s oldest and most prestigious awards competition focusing exclusively on sustainability. The LID project was the result of a partnership between the cities of Mesa and Glendale working with Logan Simpson landscape architects and stormwater specialists. Like most communities spanning Arizona, the cities of Mesa and Glendale historically considered stormwater to be a nuisance that needed to be quickly eliminated through an expensive pipe and channel system. 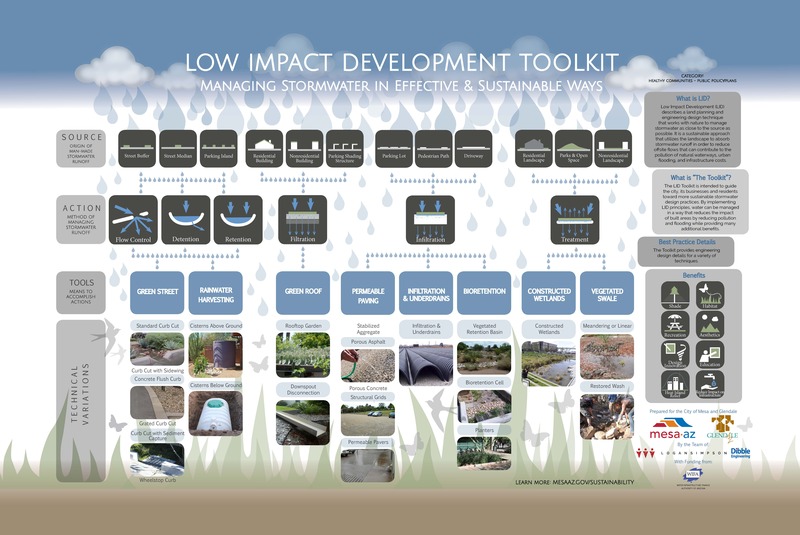 By developing and advancing Low Impact Development, these communities are shifting the stormwater paradigm and recognizing stormwater as a resource that can be used to promote healthy urban communities. LID is a stormwater management method that engages native materials and simple tools to reduce runoff and pollution. The toolkit provides a user-friendly menu of LID methods, best practices, technical requirements and construction details that help communities restore washes and enhance streetscapes or parks while cooling down cities at night. Read more here.